The class of 2018 of the Indian Institute of Management-Ahmedabad will pay Rs 19.5 lakh for the two-year course. This is 400% higher than what the premier B-school charged in 2007. If the fees of the two-year management course continues to rise by an average 20% every year, it will cost roughly Rs 95 lakh in 2025. Even undergraduate courses have not been spared. The tuition fee for engineering courses in the Indian Institute of Technology (IIT) has been hiked from Rs 90,000 to Rs 2 lakh per annum. This is just the tuition fee—the total cost is much higher. At an average running inflation rate of 10%, a four-year engineering course that costs Rs 8 lakh today is likely to set you back by Rs 17 lakh in another eight years’ time. By 2030, the same would cost more than Rs 30 lakh. If you have not planned well, you could get a rude shock, falling way short of the required corpus when your kid is ready for college. In fact, for engineering and medical aspirants, the costs start even while the student is in high school. Coaching institutes charge anywhere between Rs 80,000-1 lakh a year for preparing the student for the entrance exam. This sharp spike in fees is a wakeup call for parents saving for the higher education of their children. “Higher education costs have the highest inflation rates in the country. Parents need to realise it is going to be an expensive affair,” asserts Nitin Vyakaranam, CEO, Arthayantra. This week’s cover story is aimed at parents who are saving for their children’s education. The investment options before them will depend on the age of the child. If the child is 3-4 years old, the investment choices and strategy will be different than for a parent whose child is 15-16 years old. Our story lists the most appropriate investment options for three broad age groups and the strategies to be followed at each stage. Choose the one that fits your situation to achieve your dreams for your child’s higher education. Higher education costs may be rising at a fast clip, but Delhi-based Balbir Kaur is not perturbed by the projections of future costs. 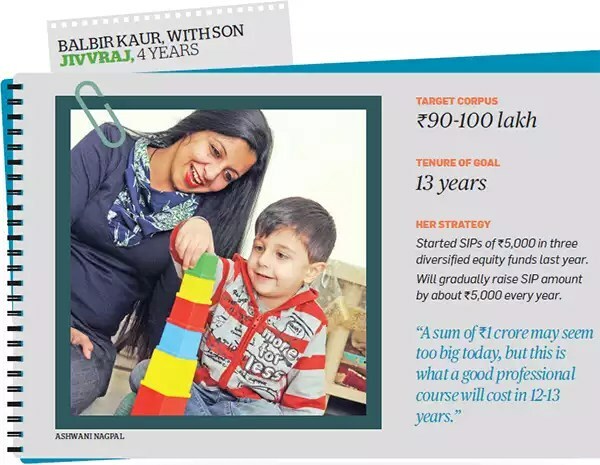 Balbir and her husband Puneet are saving for their son Jivvraj’s higher education. 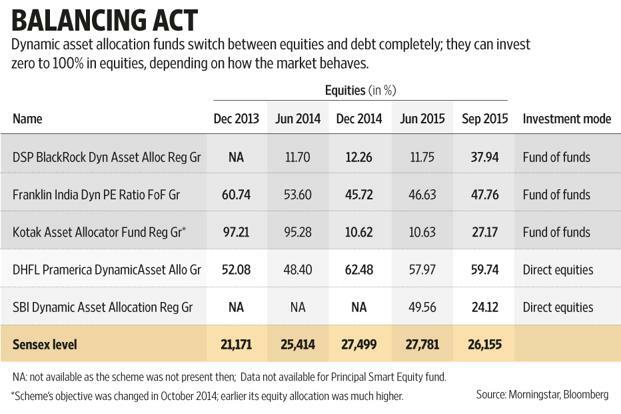 They started small last year with SIPs totalling Rs 5,000 in three mid-cap equity funds. If they continue with that amount and their funds earn 12% a year, the couple would have roughly Rs 20 lakh by the time 4-year-old Jivvraj is ready for college in 2029. But Balbir has a neat strategy in place. “From this year, I have increased my SIP amount to Rs 10,000 a month. We plan to keep increasing this every year as our income goes up,” she says. 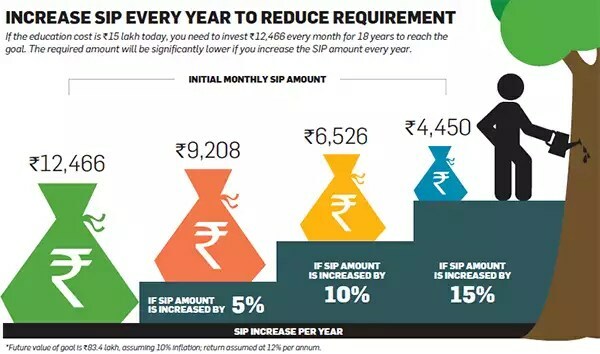 If they hike the SIP amount by 20% every year, they will accumulate over Rs 1 crore in 13 years. Starting early also put lesser burden on your finances because it requires a smaller outflow. For instance, if your target is Rs 25 lakh, you need to save only Rs 5,004 a month if you start now. But if you wait for six years, you will have to invest Rs 9,195 a month to reach the target. Wait for three more years and the required amount jumps to Rs 23,875. Worse, you may not be able to invest in certain assets if the time horizon is too short. “If you delay investing, not only do you have to invest a higher amount every month, but it also reduces your ability to take risks,” says Vidya Bala, Head-Mutual Fund Research, FundsIndia. The investment strategy changes if your child is a little older. Since you have only 5-9 years to save, the risk will have to be lowered. The ideal asset mix at this stage is 50% in stocks and 50% in debt. Instead of equity funds that invest the entire corpus in stocks, go for balanced funds that invest in a mix of stocks and bonds. If your risk appetite is lower, monthly income plans (MIPs) from mutual funds can be a good alternative. These funds put only 15-20% of their corpus in equities and are therefore less volatile than equity or balanced funds. However, the returns are also lower than those of equity funds. In the past five years, equity funds have delivered compounded annual returns of almost 12%, while balanced funds have given 10.5% and MIPs have given around 8.85%. Investors should also note that the returns from equity and balanced funds are tax free after a year, while the gains from MIPs are taxed at 20% after indexation benefit. For the debt portion, start a recurring deposit that would mature around the time your child is scheduled to apply for college. If you are in the highest 30% tax bracket, avoid recurring deposits and start an SIP in a short-term debt fund. These funds will give nearly the same returns as fixed deposits but are more tax efficient if the holding period is over three years. It is also important to review the progress of your investment plan. “You should check every year if you need to step up your contribution towards the higher education kitty,” says Bala. “At times, you may put in a lump sum investment even if you have a SIP running.” Keep monitoring the cost of education on a yearly basis and accordingly adjust your investment requirement. For parents of teenaged children, the investment strategy should focus on capital protection. With the goal barely 1-4 years away, you cannot afford to take risks with the money accumulated for your child’s education. The equity exposure at this stage should not be more than 10-15%. 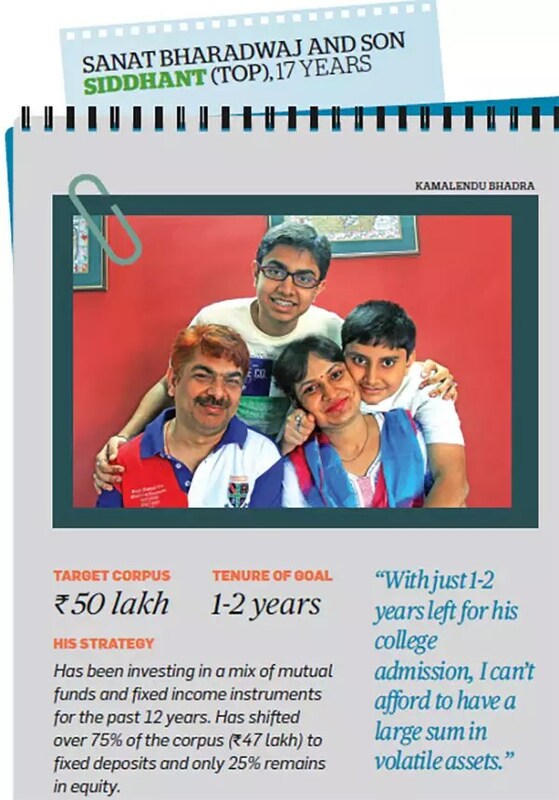 Kolkata-based Sanat Bharadwaj started investing in a mix of mutual funds and bank deposits for his son Siddhant’s college education almost 12 years ago. But now that the goal is just one year away, he has shifted 75% of the corpus to the safety of a bank deposit. This shift from growth to capital protection is critical. The 3-4 percentage points that equity investments can potentially give is not worth the risk. A sudden downturn in the equity markets can reduce your corpus by 5-6% and upset your plans. “As you come closer to your target, you should stop SIPs in equity funds and shift to a short-term debt fund,” says Kalpesh Ashar, CFP, Full Circle Financial Planners & Advisors. As mentioned earlier, the cost of higher education is shooting up. Many parents who started late or chose the wrong investment vehicles may find themselves woefully short of the target. If you face a shortfall, don’t be tempted to dip into your retirement corpus to fill the gap. This is a mistake. “Your retirement should be given priority over your kids’ education,” says Rohit Shah, CEO of Getting You Rich. Instead, you should take an education loan with the child as a co-borrower. Apart from keeping your retirement savings intact, it will inculcate a savings discipline in your child after she takes up a job. The repayment starts after a 6-12 month moratorium when she completes her education. Banks offer loans of up to Rs 20 lakh for courses in Indian institutes. If your child is keen on a foreign degree, it would require a larger corpus. While banks are willing to lend up to Rs 1.5 crore for foreign courses, they insist on part funding in the form of scholarship or assistance. When saving for your child’s education, do remember that the whole fianncial plan depends on regular contributions by you. But what if something untoward happens to you? The entire plan can crash. The only way to guard against this is by taking adequate life insurance. A term plan does not cost too much. For a 30-35 year old person, a cover of Rs 1 crore will cost barely Rs 10,000-12,000 per year. That is too small a price for something that safeguards your biggest dream. How do you make money in a market that goes up, say, 9% (2013) one year, then shoots up 30% (2014) in the next, and then comes crashing down the following year (by 2.42% so far this year)? The tried and tested way is to allocate assets properly; and invest in equities and debt as per your risk profile and market movements. But that’s easier said than done, isn’t it? Let’s see how balanced funds—these invest across equities and debt—have performed. Between February 2014 and January 2015, the category returned 42% on an average. But since February 2015 till date, the category lost 1.12%. But there’s another animal that does asset allocation more efficiently than balanced funds. They’re called dynamic asset allocation (AA) funds. As against balanced funds, which maintain a steady balance of equity and debt split, or even diversified equity funds, which always remain invested in equities, dynamic AA funds switch between equities and debt completely; they can invest zero to 100% in equities, depending on how markets behave. But does such dynamism help? Although all dynamic AA funds switch between equity and debt, not all behave the same way. Funds such as Franklin India Dynamic PE Ratio Fund of Funds (FDPE) and Principal Smart Equity Fund (PSEF) switch based on the price-equity ratio (P-E) of the CNX Nifty index. A P-E ratio, to put it simply, indicates if equity markets are overvalued or undervalued. Higher the P-E, more the markets are considered overvalued; and lower will be these funds’ equity allocation. DSP BlackRock Dynamic Asset Allocation Fund (DBDA) looks at the yield gap formula. It is calculated by dividing the 10-year government security’s yield by earnings yield of Nifty. The numerator is a proxy for debt markets, and the denominator is a proxy for equity markets. So, the ratio looks at how cheap or expensive equities are when compared to debt markets. If the number is high, it means expected returns from equities are low, and so a higher allocation to debt is necessary. While PSEF invests directly in equities and debt, funds such as FDPE and Kotak Asset Allocator Fund (KAAF) are fund of funds (FoFs); they invest in other MF schemes. All these FoFs invest in in-house schemes. In cases like FDPE, the schemes are sacrosanct. But schemes like KAAF have earmarked multiple schemes for their debt and equity allocation. 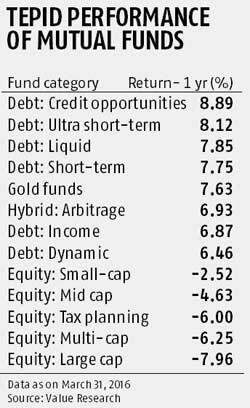 “Once the quant model decides the equity-debt split, the fund management team decides which funds (large-cap, mid-cap and so on) the FoF will invest in,” said Lakshmi Iyer, chief investment officer (debt), Kotak Mahindra Asset Management Co. Ltd.
Of all the dynamic AA funds, only three have been around for a significant period of time— FDPE, launched in October 2003; PSEF and DHFL Pramerica Dynamic Asset Allocator Fund (DPDA), both launched in December 2010. In rising markets between February 2014 and January 2015, FDPE and DPDA returned 33.27% and 26.68%, respectively, finishing in the bottom quintile of the moderate allocation category, as per data provided by Morningstar, a global MF research firm and data tracker. Morningstar classifies all schemes where equity allocation is between 30% and 75% in this category. Fortunes changed in 2015, when markets started to fall. KAAF (3.51%), DBDA (2.06%) and FDPE (1.30%) finished in the top quintile between February 2015 and 12 October 2015. But on an average, the category lost 1.12% in the same period. “There is a myth that people come to mutual funds for high returns. If that were the case, then so much money wouldn’t be invested in fixed deposits. Investors want a good experience. Returns are important, but if a fund is able to give a solution, like rebalancing, and return decent money over long periods of time, investors are happy,” said Kanak Jain, mentor, Ask Circle Mutual Fund Round Table India, one of the country’s largest MF distributor association. Most of the funds are new in this space so we don’t have long-term data on whether these models have worked or not. For instance, DBDA, which uses the yield-gap model, was launched only in February 2014. The good news is that months after its equity allocation being static at about 12% since launch, it moved up to 29% in August earlier this year when markets sank sharply, and to about 38% in September, when the Reserve Bank of India cut interest rates. “The formula did exactly what it was supposed to do, and at the right time,” said Ajit Menon, head-sales and co-head-marketing, DSP BlackRock Investment Managers Pvt. Ltd. Menon admitted it was unnerving that the formula didn’t budge all of last year and most part of this year as well. “But last year, the equity rally was a ‘hope’ rally; there wasn’t much change on the ground,” he said. While long-term returns may be subdued as compared to that of diversified equity funds, these funds are less volatile. We looked at standard deviation, a measure of a fund’s volatility. According to Morningstar, average standard deviation of moderate allocation, flexi-cap and large-cap funds together was 11.94, while that of all dynamic AA funds was between 1.95 and 7.19; which is among the lowest. “The risk-return combinations are important. These funds help significantly reduce volatility in your portfolio,” said Janakiraman R., portfolio manager-Franklin Equity, Franklin Templeton Investments–India. 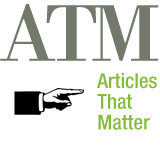 One drawback that dynamic AA funds have is in terms of taxation. On account of being FoFs, they are classified as debt funds and taxed accordingly, even if they are equity-oriented. If you sell your debt funds within three years, you pay taxes as per your income tax rates on your gains. The threshold to claim tax benefit on long-term capital gains is three years, and even then, long-term capital gains tax is 20% (with indexation benefits). That’s one reason why KAAF changed its objective, in October 2014, from being just an equity FoF to one that dynamically allocates its money to debt and equity, based on a certain formula. “Earlier, all our investments were going in equity funds and yet KAAF was considered a debt fund. A dynamic asset allocation model, therefore, is superior,” said Iyer, adding that an “unfavourable tax structure” has been one of the biggest impediments to this product becoming popular with investors. Not all financial planners recommend dynamic AA funds because they feel it is their prerogative to do their client’s asset allocation. But quite a few planners have warmed up to such funds. Yogin Sabnis, managing director, VSK Financial Consultancy Services Ltd, is a fee-based planner who still manages a motley group of investors from his early days when he didn’t charge fees. Such investors, he explains, either don’t require much financial planning or hesitate to shift to paying fees. Such clients, he said, are advised to invest in dynamic AA funds. “I don’t recommend this product to my fee-based clients because I do their asset allocation. But if someone wants a one-off advice, this is one of the first recommendations because with these funds, even if the customer doesn’t consult an adviser, the fund automatically does the rebalancing,” said Sabnis. The category does not have many schemes. And the ones that are there, don’t have long-term track records. But the ones that come with a track record have largely worked so far. The yield gap model, for instance, shows promise though DBDA lacks a long-term track record. It’s best to stick to larger fund houses and also with those that are FoFs, despite their inherent tax disadvantage. If the underlying funds come with a good track record, then the only thing you need to watch out for is the asset allocation model.